In this week’s blog, Project Conservator Katharine discusses the new Integrated Pest Management Plan for the CRC Special Collections, and describes the common pests found in heritage institutions…. Integrated pest management (IPM) is the practice of monitoring for insect activity to prevent damage to collections and cultural heritage. It was originally developed by the agricultural industry to control insect populations in crop stores without continuously using pesticides. It has now been adopted by libraries and archives as a means to monitor and deter the insect pests that use organic materials present in special collections as a food source. Insect activity in collections can be difficult to detect as most insect pests are less than one centimetre in size. They thrive in a warm, humid environment, and tend to favour dark undisturbed areas, where they can go undetected for months until considerable damage has been done. IPM has an emphasis on preventive measures such as environmental control, good housekeeping and careful monitoring in order to prevent or catch early potential infestations, with more interventive treatment methods being used only as a last resort. We are currently in the process of rolling-out our new Integrated Pest Management Plan for the University’s rare and unique collections. 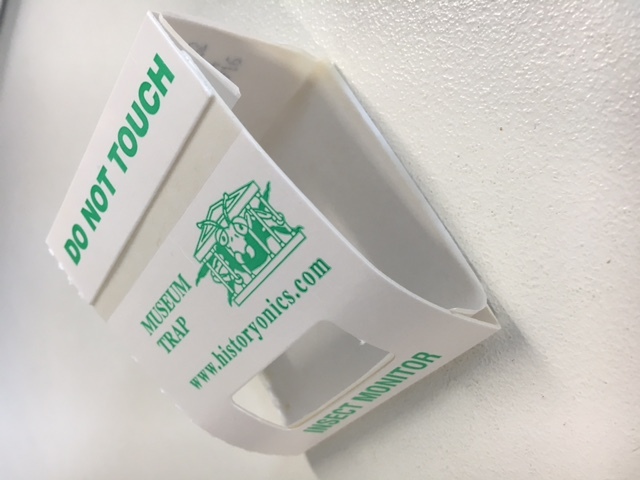 To check for pest activity present within the collections we use sticky blunder traps. These are triangular in shape, with a sticky layer of adhesive inside that catches any insect that walks across it. The blunder traps are only designed to catch a sample of the insect population present and are by no means a method of treating a pest problem. The data collected from blunder trap inspections is used to inform any changes that need to be made in terms of housekeeping, environmental management and building maintenance. Blunder traps are placed in areas where insects are most commonly found, that is: near entrance and exit points, such as windows and doors; along the edges and in the corners of rooms; and in dark undisturbed places, such as infrequently used stores and under furniture. Now let’s get to know some of the common pests found in collections! 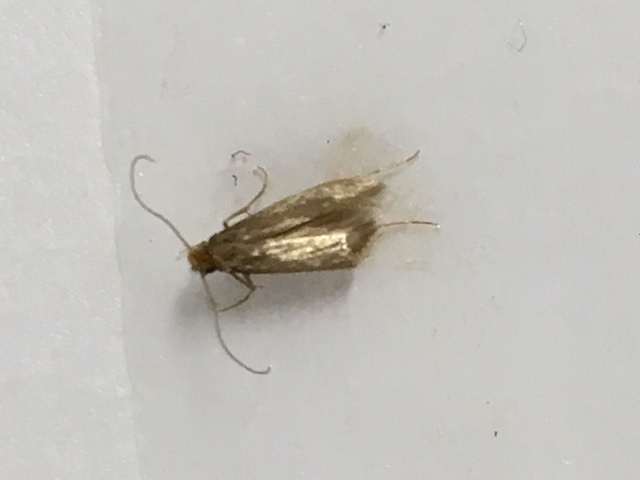 These moths are about a 5 – 7 mm in length, and have silvery gold wings. They prefer to crawl rather than fly; in fact they won’t fly at all unless it is warm. Their preferred food source are materials with animal protein in it, such as wool, hair, fur, feathers and skin. However, they will eat other materials if they are dirty or soiled. Like most insect pests it’s the larvae that cause all the damage. Clothes moth larvae are voracious feeders and leave ragged holes in materials they eat. 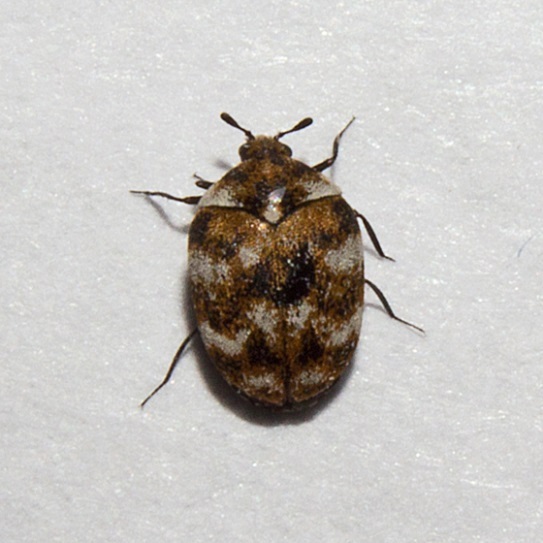 There are several different types of carpet beetles. 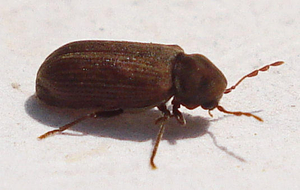 The most common types are the Guernsey Carpet Beetle and the Varied Carpet Beetle (see images above). They are both 2 – 3 mm long with circular bodies covered in colourful scales. Their larvae are completely covered with hair, earning them the nickname of woolly bears. Like the clothes moth they feed of animal protein materials. Most people know this insect as wood worm or book worm. The adults are 3 – 5 mm long with distinctive humped backs. 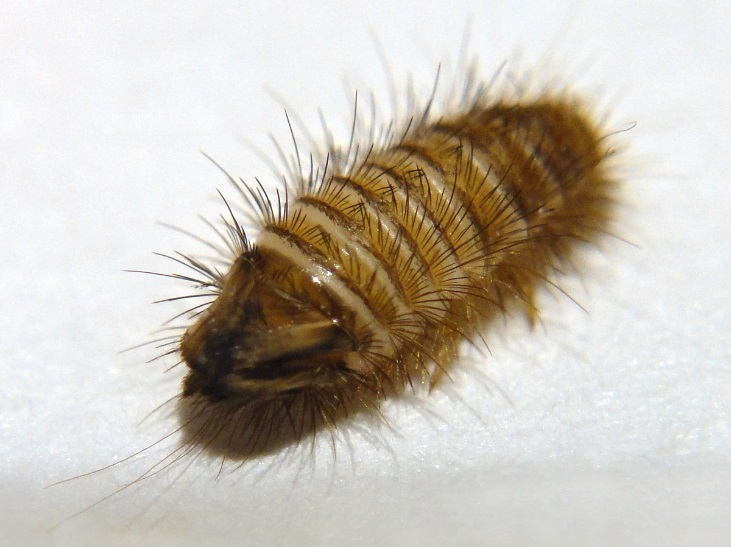 The larvae feed on furniture and other wooden objects, but they may also attack books with wooden boards. The larvae bore deep into an object where they remain for 2 – 3 years until they develop into adults. Signs of furniture beetle activity are small circular holes and/or piles of a fine orangey wood dust. Silverfish are around 10 – 15 mm in length. They feed on microscopic moulds on wide range of objects including glues and inks on paper leaving ragged, scraped areas where they have grazed across the surface. 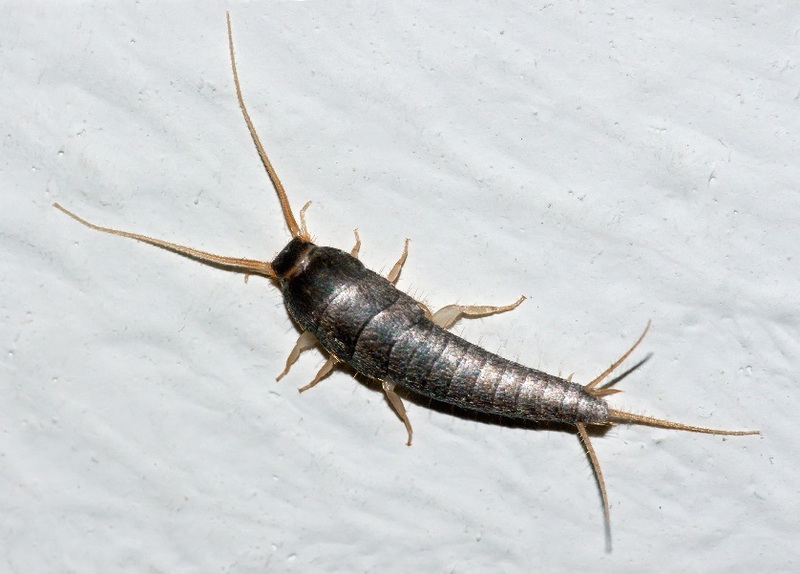 Silverfish require a high humidity survive (over 75% relative humidity). The presence of silverfish may be an indication that there is a pocket of damp somewhere in the building. If you would like to find out what other creepy crawlies might be lurking in your collection have a look at www.whatseatingyourcollection.com. It’s a brilliant pest identification resource created by the Collections Trust and Birmingham Museums. Enjoy! This entry was posted in Preventive Conservation and tagged Integrated pest managment, sticky blunder traps by conservation. Bookmark the permalink.